Boil rice, strain and set aside. 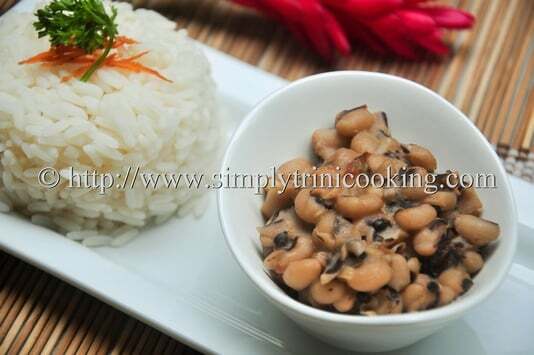 Pressure cook black eyed peas for 18 minutes or until soft, strain. Add salt to the black eyed peas. Set aside. Heat oil in a deep pot add onion and let fry until golden brown. Note the colour of the onion. At this stage it gives off an fragrant sweet odour. If adding the coconut milk powder, stir it in at this point. Add the black eyed peas to the onion and stir. Adjust salt if needed. Serve over the rice.